Christians United for Israel: The most insanely pro-Israel conference of the year. The Christians United for Israel want nothing less than total victory. 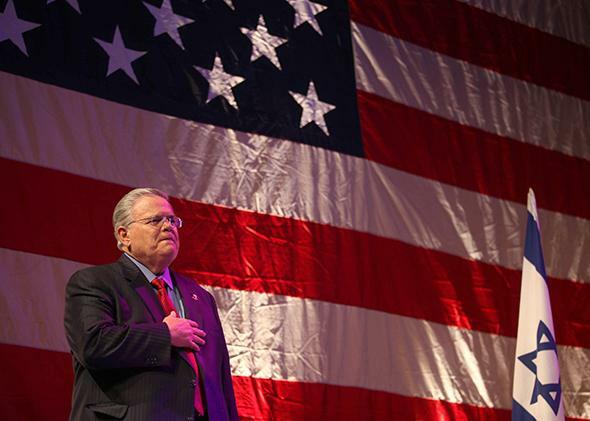 John Hagee, the evangelical pastor who founded Christians United for Israel, attends a CUFI summit in Jerusalem, on March 8, 2010. July 20 was the 13th day of Israel’s Operation Protective Edge, and the deadliest. On the morning of July 21, as they trickled into the annual Christians United for Israel conference, the mostly American supporters of the Jewish state walked past muted TVs blaring the latest damage reports from this-or-that foreign correspondent. More than 100 Palestinians died in one day; more than 445 Palestinians since the operation started. CUFI claims to be the world’s largest coalition of pro-Israel evangelicals. Nobody disputes that; critics actually prefer to promote Hagee as the face of the movement. In 2007, after CUFI started to gain momentum, Hagee published a book laying out how the apocalypse would happen—the Antichrist, if you were wondering, would be “the head of the European Union”—and in 2008 John McCain’s presidential campaign was cowed into denouncing him. Progressive journalist Max Blumenthal reported on the 2007 Christians for United Israel conference and asked the faithful if they were looking forward to the rapture. After getting a few yeses—and after asking Hagee pointed questions about Scripture—Blumenthal was sent to the exits, and CUFI got more gingerly and careful in its approach to the media. How careful? The reporters who showed up—many from conservative or pro-Israel media—were guided through a metal detector to a filing center, away from the main conference. At the appropriate times, we were guided from the first floor hideaway to the third-floor ballroom where the plenary sessions were being held. When the sessions ended, we were given time to wrap up, then politely guided back downstairs. Hagee keeps saying this stuff; CUFI keeps separating itself from the rapture-ready bestsellers. On Monday I asked David Brog, the Jewish executive director of CUFI, whether Four Blood Moons was informing any of Hagee’s or the activists’ thinking about the crisis in Israel or Russia. The politicians were limited in what they could say. They had been to Israel—Graham credited a trip he took with the Adelsons for “changing my life.” But they were not Israelis. Over two boisterous days, the only speaker who brought the crowd to silence was Sgt. Benjamin Anthony, an Israel Defense Forces veteran whose organization Our Soldiers Speak sent him to campuses and other hot zones to describe the reality in Israel. What the IDF needed was a total victory. “Rocket factories can be destroyed,” said Anthony. “Weapon factories can be destroyed. Terrorists can be eliminated. Tunnels can be dug out.” But it could only happen if America resisted the temptation to criticize Israel or to stop the operation.